Democratic congressional leaders say they reached a deal with President Donald Trump to protect DACA recipients. But Trump says no deal was reached. President Donald Trump and Democratic congressional leaders recently discussed protecting undocumented immigrants under the Deferred Action for Childhood Arrivals program. But finding out how that Wednesday night meeting went depends on whom you ask. Earlier this month, the Trump administration said it's rescinding DACA, which currently lets about 790,000 undocumented immigrants remain in the U.S. But now, Congress has six months to come up with a legislative solution. 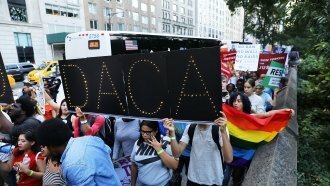 After Wednesday's meeting, Senate Minority Leader Chuck Schumer and House Minority Leader Nancy Pelosi released a joint statement saying, "We agreed to enshrine the protections of DACA into law quickly, and to work out a package of border security, excluding the wall, that's acceptable to both sides." White House press secretary Sarah Huckabee Sanders disputed the Democrats' story, tweeting "excluding the wall was certainly not agreed to." That would be the so-called U.S.-Mexico border wall Trump wants to build. Since Mexico won't pay to build it, Trump turned to Congress for the funds. Pelosi later released a less definitive statement saying she, Schumer and Trump "agreed to a plan to work out an agreement to protect our nation's DREAMers from deportation." Trump pushed back even further against Pelosi and Schumer's claims Thursday morning, tweeting no DACA deal was reached and that he will move ahead with the wall. But he later told the White House press pool that he's "fairly close" to a deal on DACA. If the two sides can come to a consensus, it would be their second major agreement this month. They previously agreed to extend government funding and to raise the debt ceiling.